Looking for a Father's Day gift? From June 9-11, my Viking historical fiction novel, God's Hammer, will be on sale on Amazon.com for 99 cents. Get your copy here. 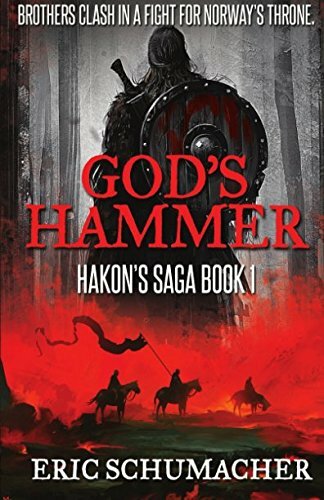 God's Hammer tells the story of Hakon Haraldsson and his brutal fight for the High Seat of Viking Age Norway. AD 935: The North is in turmoil. King Harald Fairhair has died, leaving the High Seat of the realm to his murderous son, Erik Bloodaxe. To solidify his claim, Erik ruthlessly disposes of all claimants to his throne save one: his youngest brother Hakon. Erik's surviving enemies send a ship to Wessex, where Hakon is being fostered in the Christian court of King Athelstan. Unable to avoid his fate, Hakon returns to the Viking North to face his brother and claim his birthright. Armed with his dream of becoming the first Christian king of his father's realm, yet confronted with the limitations of his youth and the hostility of the Northmen he would rule, Hakon soon learns that victory might come only by sacrificing that which he holds most dear. God's Hammer is available for print and Amazon Kindle in English-speaking markets. If you prefer listening to your books, God's Hammer is also available in audiobook format.